A key scientific research center has voiced concerns that the alignment cubes put in place are far from enough to repel the White Doves. Activate additional alignment cubes at Umbriel Laboratories. Take advantage of the fact that you start outside the tunnel system to examine the orientation of each tunnel branch. Within each tunnel sphere is an Alignment Cube whose yellow amplifier must be pointed away from Uranus. Each Cube only requires one rotation to do this. 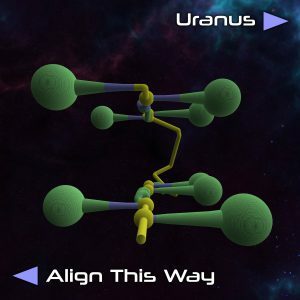 The first Alignment Cube requires a right turn toward Uranus, and therefore you must rotate the Cube to point towards yourself as you approach it (so that the amplifier will point away from Uranus). You will need to quickly determine on which side the amplifier is before reaching it with the Bumper. The second Alignment Cube requires a left turn away from Uranus, and so you must point the amplifier away from yourself as you approach it. Repeating this for all Alignment Cubes, starting with the first right turn, you must point the amplifiers in the following direction (relative to your ship as you approach the Cube): Toward, Away, Toward, Toward, Away, Toward, Toward, Away.